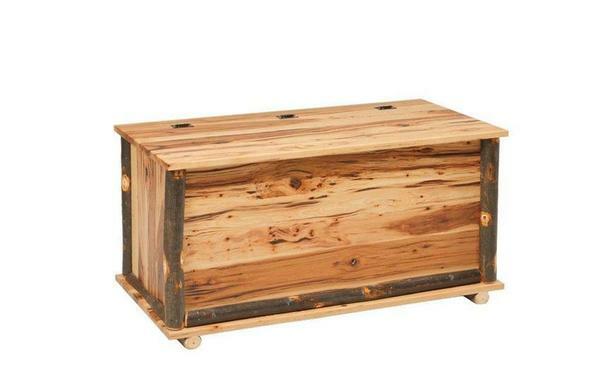 This Hickory Hope Chest is both alluring and refined. Hope Chests are a great addition for Bedrooms and were traditionally for young women to keep their Wedding Dress. This Amish Hickory Hope Chest is made to order and handcrafted by the Amish so you can be rest assured that it is made in the U.S.A and is built to last a long time. This Amish Rustic Cabin Hickory Hope Chest usually ships within 5-7 weeks. If you have any questions or concerns about this Amish Hickory Hope Chest please call 1-866-272-6773 to speak with an Amish Furniture specialist who is more than willing to take your call and help you along with your selection of Amish Hickory Wood Furniture. Quality Takes Time – Typical Build Time for This Piece is 14 to 16 weeks.